Dusk was closing in as Jesus huddled with His disciples in the Upper Room. The encroaching darkness was like a foreboding of what lay ahead and it weighed heavily on the Master. The enormity of it descended mercilessly on Him as they later sat in the Garden of Gethsemane. “My soul is exceeding sorrowful, even unto death,” He confessed to His disciples. “Tarry ye here, and watch with me,” He requested (Matthew 26:38). Moving a little distance away, He “fell on His face, and prayed” (v. 39). That is a man in utter anguish. That is a prayer of life and death. Jesus knew His mission on earth wasn’t going to be a walk in the park but when He envisaged how it would end, when the horror of it all stared Him in the face, His human nature shrank from it. He made the same plea three times, asking God if there could be an alternative and as one Gospel account shows, He laboured so intensely in prayer, that His “sweat was as it were great drops of blood falling down to the ground” (Luke 22:24). “O my Father, if it be possible, let this cup pass from me,” He cried (Matthew 26:39). God responded by sending an angel to strengthen Him for the ordeal ahead (Luke 22:43). Earlier, when they were in Caesarea Philippi, and He explained to His disciples what was about to happen to Him, Peter objected strongly. “Then Peter took him, and began to rebuke him, saying, Be it far from thee, Lord: this shall not be unto thee” (Matthew 16:22). Peter had just declared by divine inspiration that Jesus was “the Christ, the Son of the Living God” in response to the Master’s question, “Who do you say that I am?” Jesus commended Him highly for this (Matthew 16:13-19). Yet, in the next breath, speaking as a man, he uttered words that discouraged Jesus from accomplishing His mission. Jesus’ response, harsh to the human ear but spiritually fitting was, “Get behind me, Satan! You are a hindrance to me. For you are not setting your mind on the things of God, but on the things of man” (Matthew 16:23 – ESV). In the end, against all odds, Jesus bore the humiliation and the agony of crucifixion as it was written about Him trusting God for a triumph over death on resurrection morning. And glory to God, as prophesied, early on the first day of the next week, He arose! (Matthew 28). His life is an example to us. Much of what God would have us do for His glory, for our own good and for the blessing of others might not be palatable to our flesh. Family and friends may protest, wearing us out with contrary counsel, which though well-intentioned, will set us far from God’s purpose for our lives. Some of these counsellors may have given us insight from the Father’s heart in the past. But if we are determined to obey God, He will alert us when they are speaking as mere men. In his distress, Jesus went to God in prayer. We can’t go wrong when we take our challenges to God for He is still “an ever-present help in trouble” (Psalm 46:1 – NIV). Ultimately, may our testimony be like that of our Master Jesus, that against all odds, we obeyed God. We bore the shame and the pain and we inherited God’s glory as the Scripture has promised. “And if children, then heirs; heirs of God, and joint-heirs with Christ; if so be that we suffer with him, that we may be also glorified together. For I reckon that the sufferings of this present time are not worthy to be compared with the glory which shall be revealed in us” (Romans 8:17-18). Let it be so in Jesus’ name. Amen. The scriptures used in this post are from the King James Version of the Holy Bible except where otherwise stated. Bless you, Chibozor, and have a wonderful Easter in Jesus' name. Honored I knew this was coming. Yes! "In the end, against all odds, Jesus bore the humiliation and the agony of crucifixion as it was written about Him trusting God for a triumph over death on resurrection morning. And glory to God, as prophesied, early on the first day of the next week, He arose! (Matthew 28)." What a gift! ...what a privilege! ...what a load of thankfulness we owe. Forth in Your Name, O! Lord we go! Amen, Amen, big Sir Osita! I wish you a wonderful Easter in advance. Thank you so much, Kendy! Glory to God! "Much of what God would have us do for His glory, for our own good and for the blessing of others might not be palatable to our flesh." Thank you for this challenge to live obediently like Christ! Delighted you came by, Charlie! Yes, may God help us to obey Him in spite of the difficulties involved in Jesus' name. Amen. Have a great Easter, you and your family in Jesus' name. "In his distress, Jesus went to God in prayer. We can’t go wrong when we take our challenges to God for He is still “an ever-present help in trouble” (Psalm 46:1 – NIV)." Amen! It is my hope and prayer that when I am troubled that I will run to Jesus more and more quickly. Thank-you for this timely reminder to obey our Heavenly Father no matter what the cost. So glad to hear from you, Wendy! Glory to God and a beautiful Easter to you and yours in Jesus' name. THANK YOU MA, FOR THE WRITE-UP. HE KNEW HIS MISSION HERE ON EARTH , BUT IT IS UNFORTUNATE THAT MANY OF US DON'T KNOW ABOUT OUR EXISTENCE HERE ON EARTH. THE CROSS ON MY MIND. May God grant us clarity of vision and focus in Jesus' name. May you be fabulously blessed in this season in Jesus' name. What a Savior we have in Christ! Thank you for the reminder of seeking His will over the cries of our flesh. Thanks a lot, Christina. His grace is always sufficient for us. Happy Easter to you and yours in Jesus' name. God please, give me a humble and patient spirit just as you have, may i never be shaken by the things of the world rather may i live by your word and by your law. May your spirit dominate every phase of may my daily life potray your holiness, mercy, grace and himility...Amen. I love this prayer. Amen in Jesus' name. Stay blessed, Chisolum! What words! What a Father we have in heaven to make such a sacrifice. We may never understand the depth of his love. Thanks for weaving this truth so poignantly. And thank you for being a lovely friend, one that reminds me of the Saviour by your kindness and graciousness. Glory to God Most High for His amazing grace. Amen. Good write up. Only God can do these things; a father with an endless love for his children. Keep teaching and reminding us ma, we love you. +Nyoung. Thank you, Daniel! Bless you and yours in Jesus' name. Hi Edith, You're a very engaging writer. This read more like a book than a blog post. The plea Jesus made three times is one of the most fascinating aspects to me. He clearly didn't think there was any chance He wouldn't go to the cross. So why the same plea repeated like that? Would seem so it could be recorded for us so we'd know there was no other way. Hi Scott! Thank you very much. All glory to God! Yes, I would think so too. It happens to us sometimes when we know God what wants us to do, we pray for our own idea still. In our own case, we are clearly seeking a way out of something we don't fully understand or consider unpleasant. Thank you so much for dropping by and a very happy Easter to you and your family. Yes, I agree with your conclusion, that may our "testimony be like that of our Master Jesus, that against all odds, we obeyed God. We bore the shame and the pain and we inherited God’s glory as the Scripture has promised." That is what I want my life to be. But, honestly, too often I am sleeping instead of watching. Just like Peter and John were while Jesus was praying that agonizing prayer. Yet, how much our Savior loved Peter and John-- even in their imperfection. And, how much He loves us! Have a great day, Edith! Yes, how He loves us and how He supplies strength for our weaknesses! You are highly blessed, Kathleen! Yes He did. We just need to accept the gift He has freely given. You are highly blessed, Chidi! He didn't have to but he did. Thank you Jesus always. Amen in Jesus' name. Showers of blessings on you and yours, Osmond! 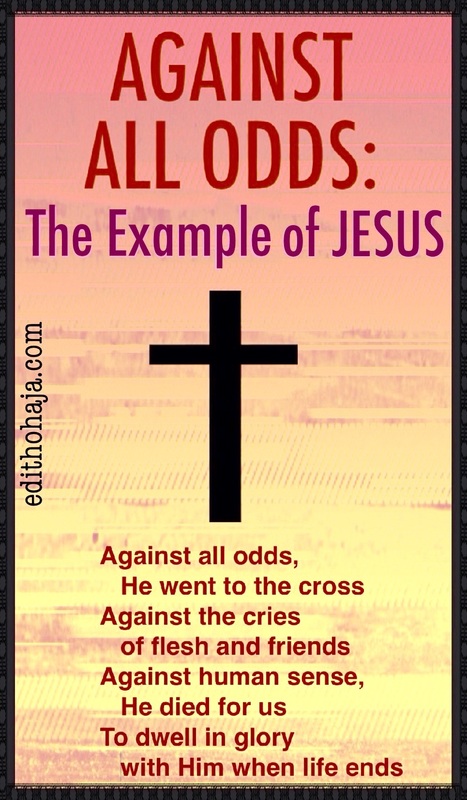 "Against all odds" He went as far as on the cross for me, just to see me sound and saved. Dear heavenly Father, give me the grace to go "against all odds" in representing you well in this world. Help me Lord to fulfill your mandate, enable me to follow this good example of yours. I need to be self-less just for you. Help me Lord, Amen. Woman Evangelist ma, I respect you. How you go about using write-ups in piercing the hearts of men just for Jesus is so fabulous. Well done ma! It's the Lord's doing, my dear! His Spirit in action! All glory to His name! I say a big "Amen" to your prayer, Chet! His banner over us is love...i pray that He will hp us to understand and appreciate wot it means to be humble. Wonderful write up MA. For my sins, Christ died. He paid the ultimate price, I am now victorious in Christ. I have power over self, Satan and sin.Christ came to show us what love really means. i encourage every one to embrace Christ so that they would be partakers of his divine love. This is so inspiring. As Christians we must live by the will of God against all odds. Though, it's not easy as mortals, we must overcome our flesh and stick to what God requires of us. this post is really inspiring.thank you so much ma. This is not just a poem, it's a divine revelation. Ma your teachings are explanatory and well understood. Through sequential explanation, breakdown of words with references from bible verses, u were able to make one get an insight into what the word of God is talking about. JESUS was never willing to give in to discouragements, they are inevitable you know. He was bent on carrying out his divine assignment. And that he did. It behoves us therefore to live out his purpose upon us with every sense of responsibility bearing in mind that there is great dividend in serving him. AGAINST ALL ODDS! Wow. The life of Jesus is such an inspiring example for everyone. This example teaches us to Forge Ahead In Times of Hardship (FAITH). Jesus looked away from the pain of the cross as He embraced the cross, and focused on the glory ahead. In all our life endeavours, especially in our christian life journey, we must not allow our present challenges to becloud our view of our glorious future. Thank you Ma for this success booster. "May we, like Jesus, obey God and fulfil His purpose for our lives against all odds". May His grace keep us obedient and running to the end so that like Paul we can say, we have finished the race. Only then can we win the prize that comes with finishing. Thank you for this descriptive piece. May the benefit of His death be made a reality in our lives. This is so touching!!! He died that we may have life to the fullest and most people don't want to key into this divine blessing. Rather, they follow the things of the world and their lives become shortened. Father, help us all, as it's only you that can do it. Great yet again. From who else? Aunty Edith. Am always assured that I'll always learn from you. Just like Jesus did, we will fulfil our purpose in life. Glory to God, Ononso! May it be so in Jesus' name. Jesus Christ accepted the shame, humiliation, torture, and above all, died on the cross of Calvary for me. Father Lord! Help me never to depart from you despite all odds. With you by my side, I have nothing to fear. Amen! God bless you Ma. May God help us discover our own purposes on earth and enable us to pursue them despite stiff oppositions and distractions of this world. I pray we get the grace to overcome the weakness of the flesh and fulfil that which is the will of God for us. This goes to show that as Christians, we should be able to follow Christ against all odds just as he did for us at the cross. This writeup is one everybody should read because it draws our attention to the prize Christ paid for us. God bless you, ma. What sacrifice could be greater than Jesus Christ giving up his life. He died in an agonizing way. But then..... He rose from the dead on the third day. What a way to console us! What other excuse do we have not to be good and believe in God? FOR God so loved the world that he swnt his only begotten son to save us, we should always bear this in mind anywhere we go! Christ was faced with so much challengs yet he didn't guve up so when we want ti give up we should remember that God loves and care about us. Thank God for the wonderful example of Jesus, if not, what would have been the story of mankind? Today, I receive the enduring grace of God to press on despite the circumstance. Thank you Ma for this amazing write up, my prayer today and always is that God will give us his children the grace and zest to triumph over all temptations that the devil may send our ways just as Jesus rebuked Peter for going out of the divine spirit of God which helped him recognize Jesus as the Christ the son of God. if we say we are the children of God, then we should know that jesus is a role model to us. if he was able to endure the torture of the cross for our sake, we should also learn to worship God amidst whatever may be the distraction. we are supposed to bury the desires of the flesh and submit ourselves to the will of God, he who has called us will equip us for the pain and suffering ahead and at the end of the day, we will have eternal victory in christ. As a student, it is easy to give up after one bad experience or the other. we want to stop pressing forward and just relax. but i have decided to be like jesus and never give up aganist all odds. i will always bear the present so as to enjoy the future. the devil may want to convince me that God has abandoned me but i believe that he is faithful and if i should be like jesus, he will save me and give me the prize at the end of the day. Honestly, I say thank you Jesus for everything. I pray that i will be able to carry your name and withstand the pressure that this world brings with it. “O my father, if this be possible, let this cup pass from me ," he cried (Matthew 26:39). Christians should pray from this perspective rather than forcing God to take away their cross by all means necessary.... Christianity without suffering is a farce. Help us Lord to know the will of God for us in every suffering we encounter in life Amen. The life of Jesus is an example to us. Much of what God would have us do for His glory, for our own good and for the blessing of others,we may not like it but we have to do it. Be courageous and be different,you must like Jesus walk away from the crowed, you must take the path alone when necessary if you must succeed in your endeavors. Jesus is our model let us learn from him.